Using multiple-group confirmatory factor analysis (CFA), this study investigates the measurement equivalence/measurement invariance of identical online/web-based and paper-and-pencil administrations of 8-item shortened version of the Survey of Perceived Organizational Support (SPOS) developed by Eisenberger, Huntington, Hutchison, and Sowa (1986). The results provided support for configural, metric, and scalar equivalence across administration modes, indicating that the psychometric properties of the 8-item shortened version of the survey are similar whether administered as a paper-and-pencil or an online measurement instrument. Bu araştırmada, çoklu grup doğrulayıcı faktör analizi kullanılarak Eisenberger, Huntington, Hutchison ve Sowa (1986) tarafından geliştirilmiş olan Algılanan Kurumsal Destek Ölçeğinin sekiz maddeli kısa versiyonunun online/web tabanlı ve kağıt–kalem ile uygulamaları bakımından ölçüm eşdeğerliliği/ölçüm değişmezliği test edilmiştir. Sonuçlar biçim, metrik ve skalar değişmezliğini desteklemiştir. Ölçeğin psikometrik özelliklerinin iki anket uygulama biçimi bakımından benzerlik gösterdiğine dair bulgular elde edilmiştir. Ahmed, I., & Nawaz, M. M. (2015). Antecedents and Outcomes of Perceived Organizational Support: A Literature Survey Approach. Journal of Management Development, 34(7), 867-880. Bartram, D. (2005). Testing On the Internet: Issues, Challenges and Opportunities in the Field of Occupational Assessment. In D. Bartram & R. Hambleton (Eds. ), Computer-Based Testing and The Internet: Issues and Advances (pp. 13-37). New York: Wiley. Bass, B. M., & Avolio, B. J. (2000). Multifactor Leadership Questionnaire: Technical Report, Leader Form, Rater Form, And Scoring Key For MLQ Form 5x-Short. Redwood City, CA: Mindgarden. Brannick, M. T. (1995). Critical Comments on Applying Covariance Structure Modeling. Journal of Organizational Behavior, 16, 201-213. Byrne, B. M. (2016). Structural Equation Modeling With AMOS: Basic Concepts, Applications and Programming. New York, NY: Routledge/Taylor & Francis. Chen, F. F. (2007). Sensitivity of Goodness of Fit Indexes to Lack of Measurement Invariance. Structural Equation Modeling, 14, 464-504. Cole, M. S., Bedeian, A. G., & Field, H. S. (2006). The Measurement Equivalence of Web-Based and Paper-And-Pencil Measures of Transformational Leadership. Organizational Research Methods, 9, 339-368. Deutskens, E., de Ruyter, K., & Wetzels, M. (2006). An Assessment of Equivalence between Online and Mail Surveys in Service Research. Journal of Service Research, 8, 346-355. Dillman, D. A., Smyth, J. D., & Christin, L. M. (2009). Internet, Mail and Mixed-Mode Surveys: The Tailored Design Method. Hoboken, NJ: Wiley & Sons. Eisenberger, R., Hungtington, R., Hutchison, S., & Sowa, D. (1986). Perceived Organizational Support. Journal of Applied Psychology, 71, 500-507. Fang, J., Wen, C., & Prybutok V. (2013). The Equivalence of Internet versus Paper-Based Surveys in It/Is Adoption Research in Collectivistic Cultures: The Impact of Satisficing. Behaviour & Information Technology, 32(5), 480-490. Fowler, F.J. (2014). Survey Research Methods. Thousand Oaks, CA: Sage. Gideon, E. (2012). Handbook of Survey Methodology for the Social Sciences. New York, NY: Springer. Groves, R. M., Fowler, F. J., Couper, M. K., Ledowski, J. M., & Singer, E. (2009). Survey Methodology. Hoboken, NJ: John Wiley. Harrington, D. (2009). Confirmatory Factor Analysis. New York, NY: Oxford University Press. Hirai, M., Vernon, L., Clum, G., & Skidmore, S. (2011). Psychometric Properties and Administration Measurement Invariance of Social Phobia Symptom Measures: Paper-Pencil vs. Internet Administrations. Journal of Psychopathology and Behavioral Assessment, 33, 470-479. Kline, R. B. (2016). Principles and Practice of Structural Equation Modeling. New York, NY: Guilford Press. Kurtessis, J. N., Eisenberger, R., Ford, M. T., Buffardi, L. C., Stewart, K. A., & Adis, C. S. (2015). Perceived Organizational Support: A Meta-Analytic Evaluation of Organizational Support Theory. Journal of Management, 20(10), 1-31. Meade, A. W., Johnson, E. C., & Braddy, P. W. (2006, August). The Utility of Alternative Fit Indices in Tests of Measurement Invariance. Paper presented at the Annual Academy of Management Conference, Atlanta, GA.
Mellenbergh, G. J. (2011). A Conceptual Introduction to Psychometrics: Development, Analysis, and Application of Psychological and Educational Tests. The Hague, Netherlands: Eleven International Publishing. Muthén, L.K., & Muthén, B.O. (1998-2015). Mplus User’s Guide. Los Angeles, CA: Muthén & Muthén. Riggle, R. J., Edmondson, D. R., & Hansen, J. D. (2009). A Meta-Analysis of the Relationship between Perceived Organizational Support and Job Outcomes: 20 Years of Research. Journal of Business Research, 62, 1027-1030. Teo, T. (2013). Online and Paper-Based Survey Data: Are They Equivalent? British Journal of Educational Technology, 44(6), E196-E198. Whitaker, B. G., & McKinney, J. L. (2007). Assessing the Measurement Invariance of Latent Job Satisfaction Ratings across Survey Administration Modes for Respondent Subgroups: A Mimic Modeling Approach. Behavior Research Methods, 39, 502-509. ISNAD DOLMA, Özlü , DOLMA, Serkan . "Assessing Measurement Invariance of the Survey of Perceived Organizational Support (SPOS): Paper-and-Pencil vs. Online Administrations". 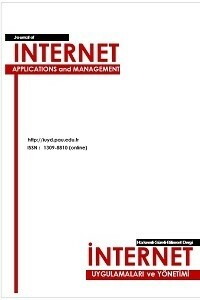 Journal of Internet Applications and Management 9 / 2 (December 2018): 21-34.